It is nice to meet an able-bodied person who looks at the world through the filter of disability. There is usually a reason and, in the case of Andrew Smerek, it came in the shape of Archer Hadley. 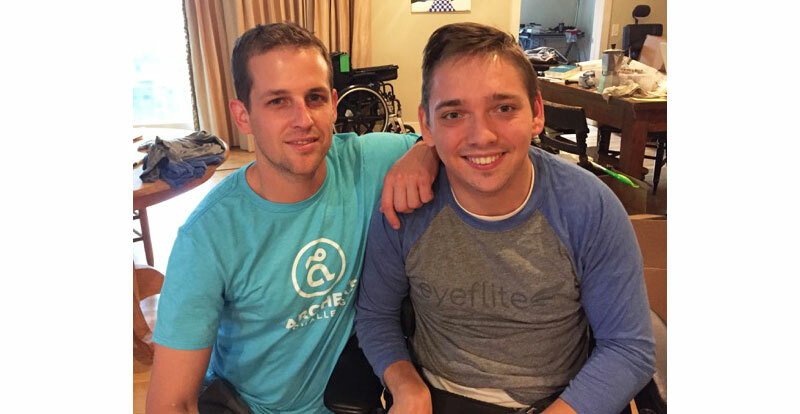 While in college, Andrew became Archer's caregiver for two years. In this role, he looked at the life Archer was living—having cerebral palsy from birth, only motor function in one arm, decreased clarity of speech—and thought he could help. Little did he know that this experience was the geneses of EyeFlite. "I was blown away by how many tasks I perform daily that are so much harder for him. Decreased finger control makes it harder to text and type, and Siri can't understand words that aren't clearly spoken. It's a very long list and I thought that there had to be a solution." Andrew was a student in engineering, which is where he met Ian. They worked together on augmented reality (AR) projects—programs that overlay digital content onto a person's real environment. "In school we built an app that you could use shopping, for example. Let's say that you are in the cereal aisle and you want to find a breakfast that is gluten free and low sugar. 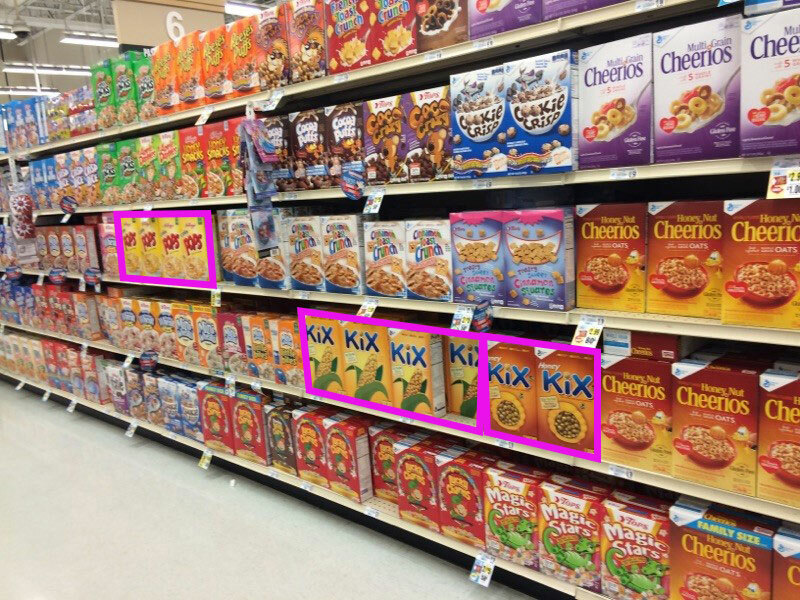 You point your phone's camera at the cereal aisle and the app recognizes the products on the shelf. It then uses ingredient information on the internet to highlight the products best-suited for you. Immediately. While you are sitting in aisle 5. It's pretty cool." This rendering of app shows cereals that might interest the user based on their filter selections. Although this application was intriguing, Andrew and Ian were passionate about making a positive difference. 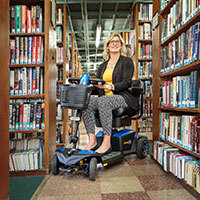 As they started out in the disability community, they found themselves becoming ever more frustrated about the lack of technology and its outrageous price tag. "As we researched what was currently available we became more and more aware of the inflated pricing once you began working on medical solutions for people with disabilities. Sure, prices are outrageously increased if you are billing health insurance, but at this point we are trying to get it to the people who need it most. And they are the ones paying for it—not insurance companies!" 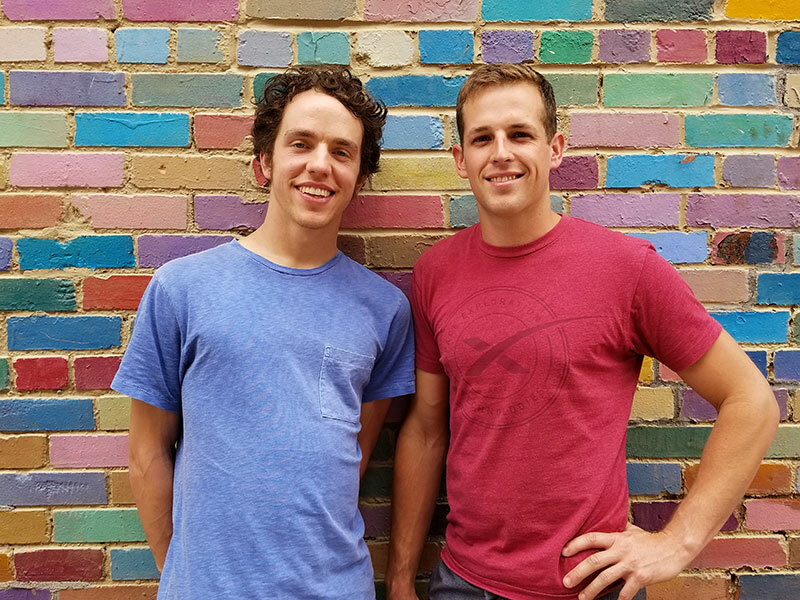 In order to introduce their new technology to the people who need it, Andrew and Ian reached out to the disability community through Abilities Expo. 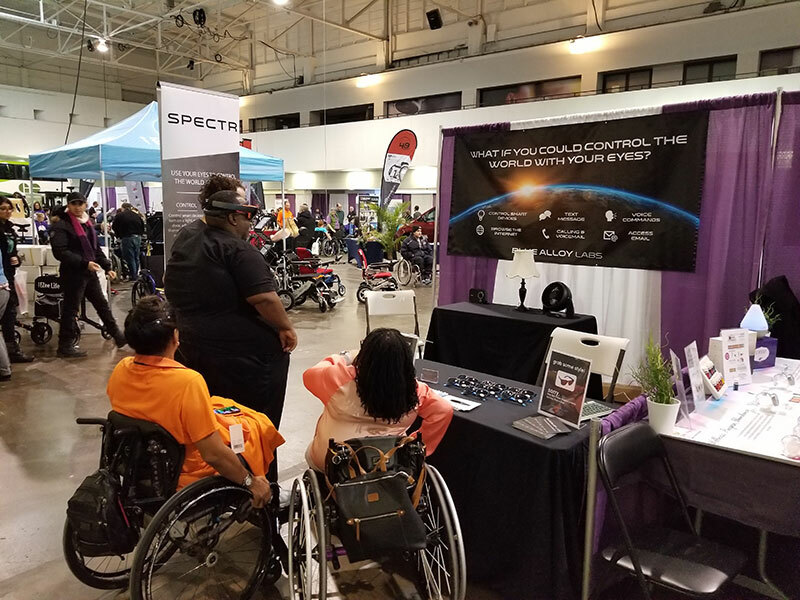 At the LA and Toronto Abilities Expos, EyeFlite was giving demonstrations of its augmented reality software to get people's feedback on a completely new experience: controlling smart devices using only head movement. With the demo, a person wore an augmented reality headset and could turn on/off a fan, a radio, a lamp and even change the color of an LED light strip without the use of hands or voice. Interested attendees check out augmented reality at Abilities Expo. Would people understand what augmented reality was when they saw digital menus on top of smart devices? Would they then know what to do to control a device? Would they like using it? How long would a person take to start controlling devices? "The community's response was overwhelming. Of course, people had fun with it, it is similar to the most advanced augmented reality products on the market. But most people could see the practical applications and got excited about the real-life possibilities." Not only were we excited to see how much people enjoyed it, but it was encouraging how almost everyone was able to control the devices very quickly. This feedback gave us the confidence to keep pushing forward with development of our augmented and virtual reality software. The great news is that the technology is just on the cusp of being released! 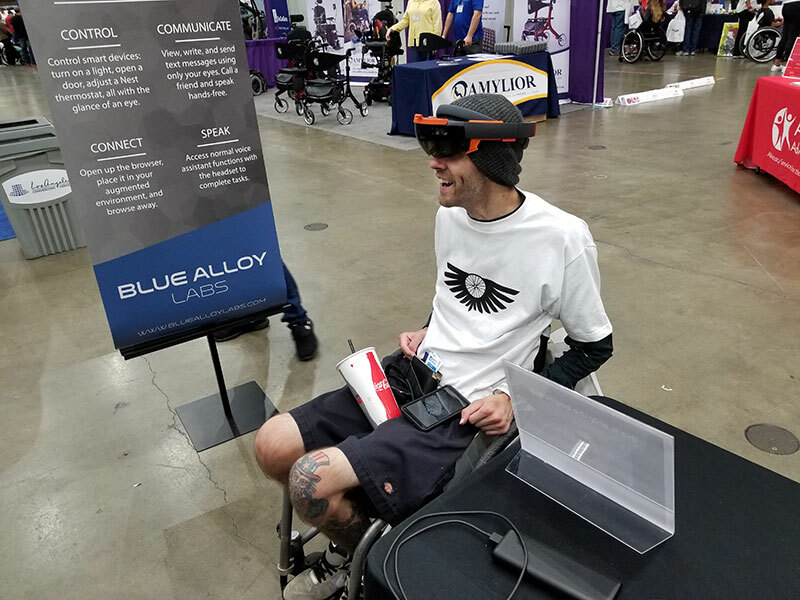 EyeFlite will be at the Abilities Expo in Houston August 3-5 at the NRG Center, and this may just be their last exhibit where they are looking for feedback only. Within a few weeks of the Houston Expo, their software will be available to purchase! A user is typing with EyeFlite's VR software using only head movement. In order to use it at home, you will need to have a virtual reality (VR) headset. They are available all over—they can be purchased online from EyeFlite's website or even Amazon. Once you get the headset, you can type using head tracking with predictive text. They plan to integrate eye tracking into the product later this year. "I was showing the system to a young mom, whose 6th grade boy was non-verbal. He was obviously having a great time! His mom told me that he was having difficulty at school because he couldn't type. He could only do about 8 words a minute in short bursts so he was being left behind his peers—quite traumatic at that age." "The other peak experience was this mom with her daughter who could only use an iPad, but she had extreme difficulty using it. After using our AR software demo, she made eye contact with her mother, clearly communicating that she wanted our product, no matter what! She even refused to remove the demo headset since she was having such a great time. It made it very hard to tell them that there wasn't a product yet that they could buy right then and there. But soon there will be; it is coming. It will be a life changing event for so many people—and we are determined that it will also be a product that they can afford." You can meet Andrew Smerek and try EyeFlite's products at the Houston Abilities Expo, NRG Center, Hall E, August 3-5, Friday – Sunday. Admission is free. Andrew will also be leading the "Augmented Reality and Virtual Reality: A New Era of Accessibility Products: New to the Expo!" workshop at the Houston Abilities Expo on Sunday, August 5, 2:30-3:30 pm.